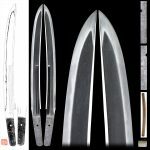 Wakizashi : Bisyu Osafune Sukesada. 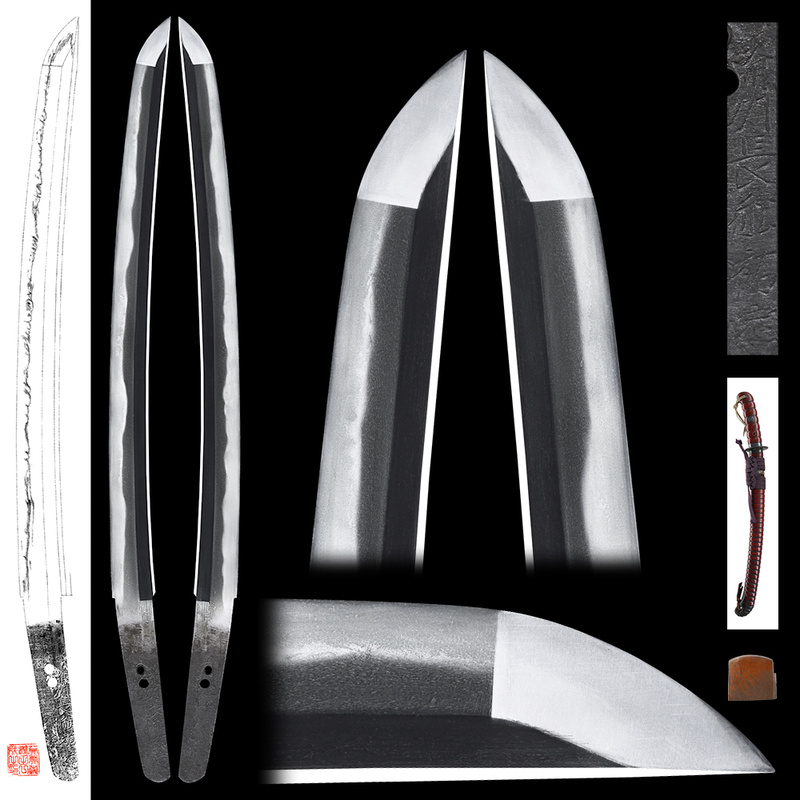 Blade length : 38.6 cm or 15.2 inches. Width at the hamachi : 2.78 cm or 1.09 inches. Width at the Kissaki : 2.08 cm or 0.81 inches. Era : Late Muromachi period. Shape : The blade is regular size nice good meat. Jitetsu : Koitame had well grained with jinie attach. Hamon : Niedeki Cyoji midair and small Cyoji midair mixed. Boshi is hakikake style rod shape. Special feature : In the Muromachi period, Harima, Mimasaka and Bizen province had been prospered under the protection of the Akamatsu family. Above all, Bizen province has turned out a great many talented swordsmiths. 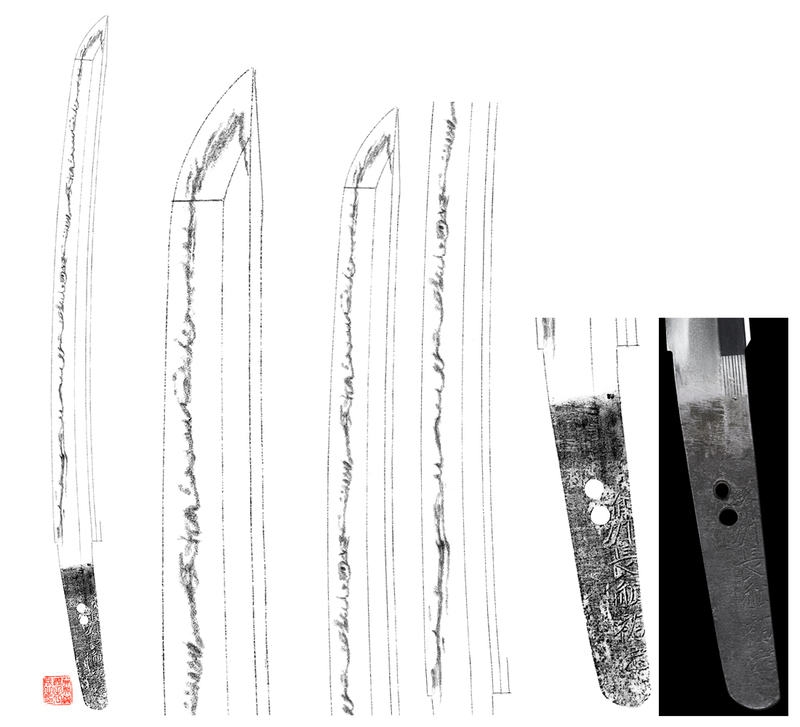 Supplying the demand of the Age of Provincial Wars in Japan, a large number of swords were made there in the late Muromachi period. Sukesada has become a synonym for the Osafune School though the founder was Mitsutada. It is regrettable that a deluge devastated the School in Osafune districts in Tensho era. Such is the way of the world that even the Osafune School, that prosperity and power had been unparalleled, perished in this way in the deluge. Old swords are all that is left to tell how once the swordsmiths lived. But the condition is very good without Kizu and flow. Koshirae : Ebi saya Koshirae(lobster shape Koshirae) unusual shape. Tsuba : Round iron tsuba. To-syo Tsuba. Saya : Ebisaya red color. Menuki : On the round silver plate, family crest is engraved. Kozuka : On the copper plate, waves are engraved. Kogatana : Signature:Tsuyama Jyu Naonori. Historical background : War time which is called Sengoku Jidai.